Our sealant finds and stops leaks too small to find any other way! It's specially formulated for use with inflatable boats, rafts and tow toys. This sealant forms a bond with the interior fabric of the inflatable, stopping or "sealing" slow leaks and preventing future leaks from developing. In one easy step, leaks are cured from the inside, which are virtually impossible to find from the outside. Our Inflatable Boat Sealant is the only product of its kind which allows for future deflation of your inflatable (for storage, etc.) without the skin sticking to itself and making re-inflation virtually impossible. It will seal the leak(s) and keep your inflatable firm for years to come. And Inflatable Boat Sealant can be used multiple times, so if your inflatable develops a new leak weeks or years from now, you can use the sealant again. Bottle contains one (1) quart of sealant. 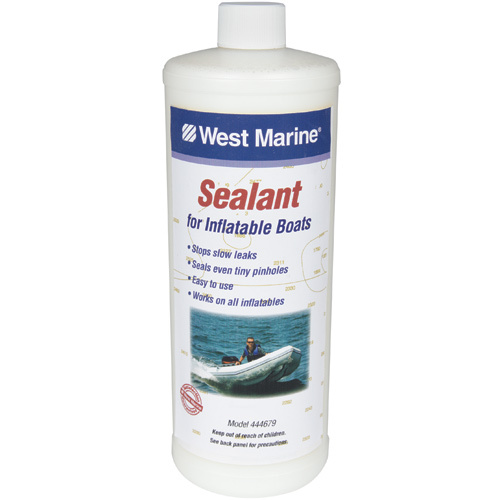 One quart of Inflatable Boat Sealant is sufficient to seal small leaks on boats 12' long or smaller. On boats larger than 12', there is a formula for calculating how much Sealant to use for each air chamber: The basic rule is: 1/2 ounce of Sealant will cover 1 square foot of material. Using more than the required amount is not better. This number, divided by the number of air chambers gives the amount of Sealant needed in each air chamber. When you are sure Sealant has made contact with the entire interior of the air chamber, walk it again! In the unlikely event that there are still leaks, re-treat the boat using only 1/3 the amount used the first time. Make sure the Sealant gets to the leaking area. Do not allow the Sealant to pool in any one area.